Had the National Weather Service not faced a hiring freeze in 1995, Kevin Selfe most likely would have been a meteorologist and not a musician. “There weren’t a lot of jobs at the time, so I kinda fell into music, quite thankfully,” says the Virginia-born, Portland-based bluesman. Selfe admits to being a bit of a weather nerd in college at North Carolina State University in Raleigh, confining himself to his dorm room to study and play guitar with his blues-loving, bass-playing roommate. “Since my major was not really popular with the ladies on campus, I had a lot of free time to play guitar in my room,” he says. 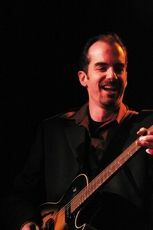 For eight years, Selfe performed with various blues bands around his bluegrass-dominated hometown of Roanoke, Va., before forming Kevin Selfe and The Tornadoes in 2005. Two years later, Selfe moved to Portland to immerse himself full time in the area’s growing blues scene and recruited new Tornadoes drummer Jimi Bott and bassist Allen Markel. “I wanted to be in a place where I could go out any night of the week and hear some world-class blues,” says Selfe. Now an established blues figure, Selfe will perform with his band at 9:30 p.m. Friday and Saturday, March 18 and 19, at Alex’s Plaza Restaurant, 35 N. Main St., Ashland. Previously of The Fabulous Thunderbirds, Bott is a 12-time Blues Music Award nominee for Best Blues Drummer, an eight-time Muddy Award winner for Best Drummer and “probably the best blues drummer in the world,” brags Selfe. Allen Markel is a former member of The Insomniacs and “like Jimi, picks up little nuances that drive the band,” says Selfe. Selfe, who also plays harmonica, compares his guitar style to that of T-Bone Walker, Freddie King and Albert King. The Tornadoes’ set list is split between Selfe’s originals and blues standards. The band prides itself on exploring both traditional and contemporary blues repertoire and have been known to transition easily from Muddy Waters’ traditional “Mannish Boy” to Freddie King’s more contemporary “Pack It Up.” In 2010, the group won a Muddy Award for Best Traditional Blues Act and, only a year before, won a Muddy Award for Best Contemporary Blues Act. While Selfe’s music is as blues as it can be, his original lyrics are surprisingly humorous, and most involve his ex-girlfriends, including “Walking Funny,” about a girl who cheated on him, and “Just Like Pulling Teeth,” a song about dating a dentist. Selfe and The Tornadoes have released two albums: “Selfe-Contained,” released in 2006, and “Playing the Game,” released under Chicago blues label Blues Skunk Music in February 2011.